Ability to expand, contract and bend around obstacles. Introducing a brand new approach to dust collection! 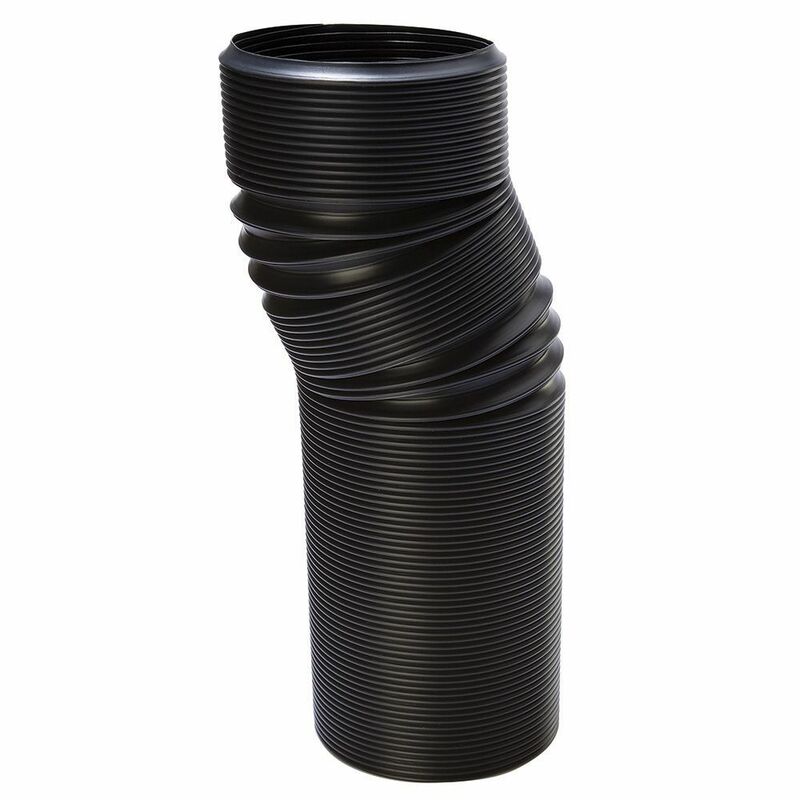 A unique segmented design allows FlexForm Hose to twist, bend, expand and/or collapse to a desired shape and length, then firmly hold that position - resulting in virtually unlimited versatility. 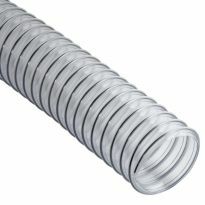 This ability to bend around obstacles, expand or contract to perfectly fit a given space, and maintain its shape makes FlexForm Hose ideal for tight spots and tricky dust collection applications where conventional hose just won't work. You'll find countless ways to use this clever product. 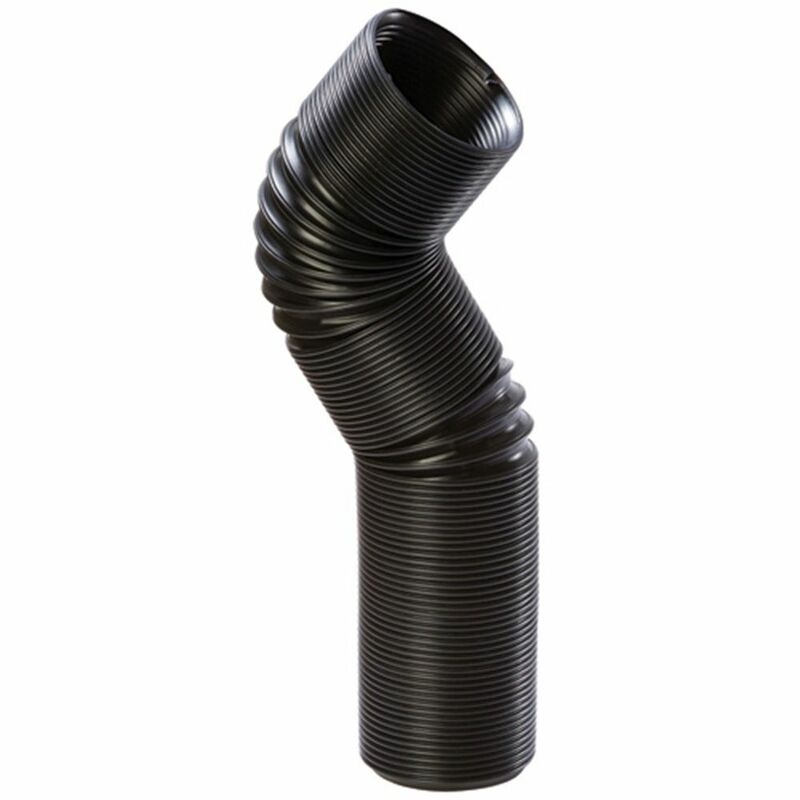 In addition, this hose expands to three times its collapsed length, from approximately 12" to 36"
Prefect for dust collection for odd angles. This is a great dust collection hose. It really fits the tools. Great product when movement and then stability are needed. Works great. 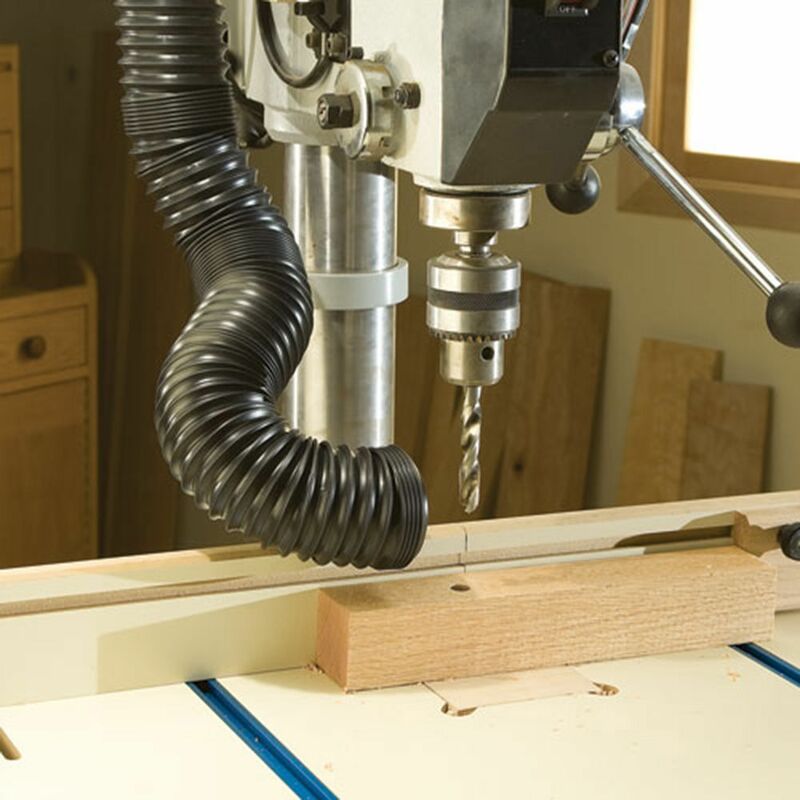 Using on my router table fence and have another on my drill press. Holds its shape and gives clearance for fence to easily move. Stays where I set it. Just what I needed as attachment to my portable tablesaw. My old hose eventually tore from all the use and duct tape can only do so much for a period of time. The store didn't stock these but I found it online with Rockler. Very good quality. Using it to collect sawdust from Sawstop jobsite saw. 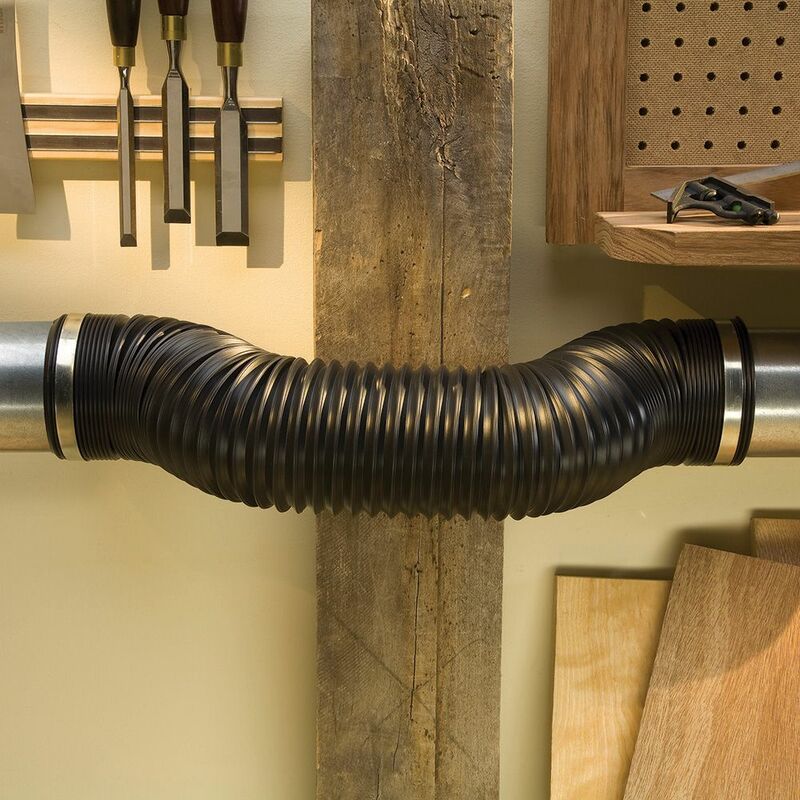 l built a cabinet inside my Rockler router table plus a dust collection box and used this hose to connect to my vacuum cleaner. It worked great! Cut down on the saw dust about 90%. Would definitely recommend it. Very versatile - easy to use! 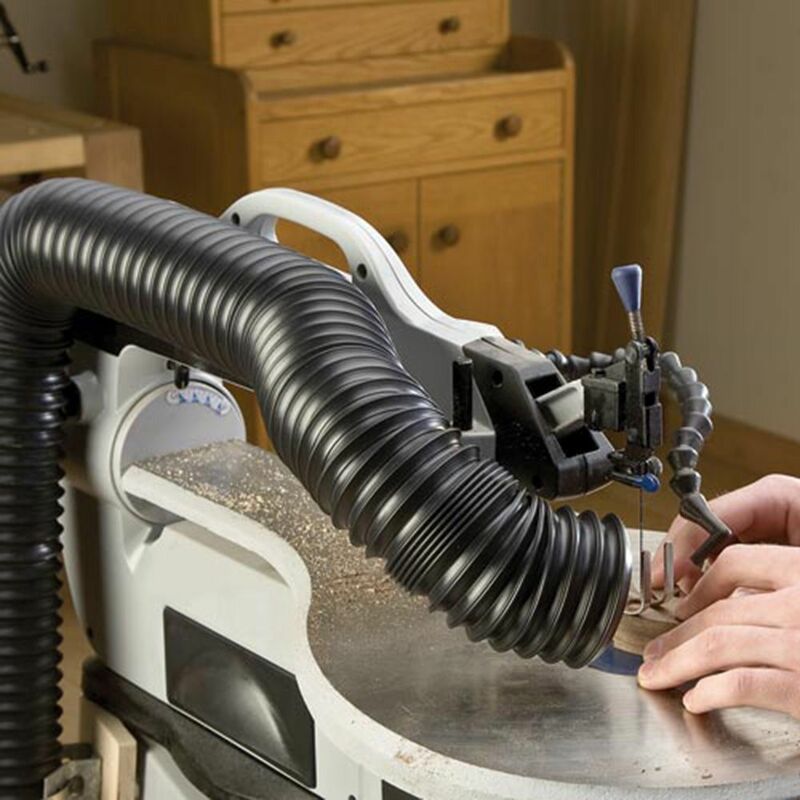 I have used several of these to set up dust collection on a bandsaw, hollow chisel mortiser and drill press. Works as it should - excellent product! Works great. Easy to install fittings. Like the way it maintains the bends you put in it. By the way I like the features that this tube provides except I had trouble fitting the ends to 2 1/2 inch fittings (thus the 2nd star loss). Lasted about 2 years. Not great for the money. these hoses flex quite a bit..until they are put under suction at which point they coil right up and almost knock over the "dust right vortex".. which happens all the time.. 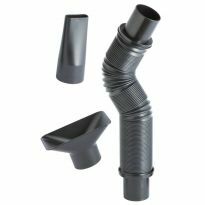 This action over time leads to the plastic cracking causing you to need to cut the hose shorter and eventually buy a new one when its too short to make the turn from the vortex to the vacuum. I purchased this to use part of my dust collection system on my router table. It works fine, though having a longer option to accommodate larger table designs would make this better. I'm really sorry I bought this. Wanted to return it, but too much of a hassle. These come collapsed, and are very difficult to expand. Even once you do, they pull back immediately into the collapsed form, making them a real pain to attach to the tool and to keep them in place. I'd much rather use the standard non-collapsible type. 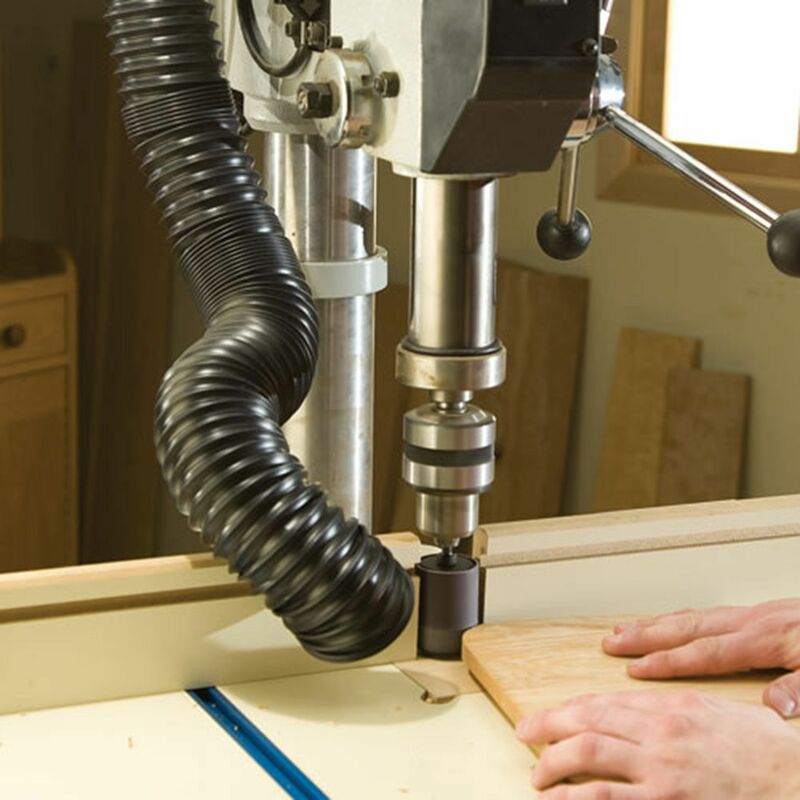 For fence on router table cabinet. To replace the hose on my Rockler Dust Right Dust Separator which had split along the wire. saw this product on YouTube- Newbie Woodworker and thought it would work for me. I have a tight spot in the run.I bought this to get it done. to use on my table saw with my shop vacuum. 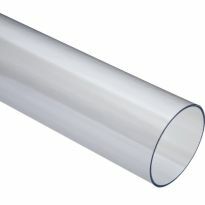 What is the tightest bend you can make with this? The port faces the wall and is about 4" from the wall; I need to make a 90 degree turn to get from the port to the blast gate. Will it bend that tightly? You should be able to fit the envelope. I just bent mine to a 3 inch from the end to the outside of the 90 degree bend, That is about a 1 3/4 bend radius on centerline. I have verified that 4", while tight, the hose will make the turn you need. 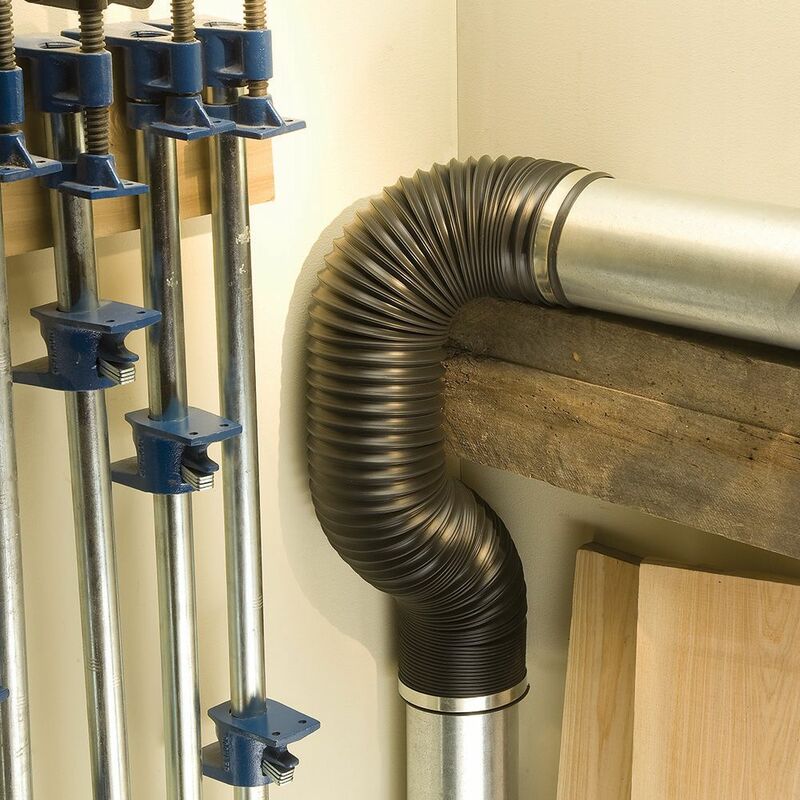 The idea is great but there are no suggestion/s on how to and what to mount the hose with to an all metal machine such as a drill press or a bandsaw. Can anyone help? BEST ANSWER: I used mine to attach to the boot from my table saw. The boot moves with the blade, but I wanted an easy access to attach my dust hose, so I attached one end of the flex hose to the dust port on the boot and the other end to the side of the table saw with a 2 1/2" clamp I purchased from Rockler and 2 sheet metal screws. Thanks Robert, turns out that there is no place on the drill press itself... Thinking outside the box, I got a 2" PVC to mount on the drill stand works great. Connectivity is a problem across most of the hose/machine/fitting issue. 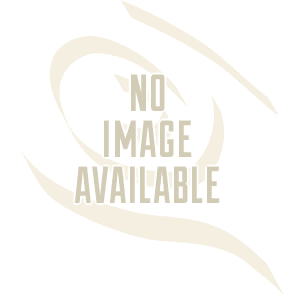 So you may need to use rubber couplings or other methods at certain connections. It fits over the 2-1/4 inch fittings. 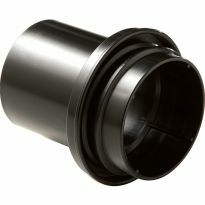 Adapters are available for 4 inch connecters.